This craps game glossary at gamerisms is divided into 3 parts and created for passionate craps shooters. Craps is defined as one of the casino strategy games. Part 2 provides a concise Betting Summary Chart that lists Multiple Roll Bets and Proposition/ Single Roll Bets, pays and vigorish. A valuable resource that you can take to the tables. 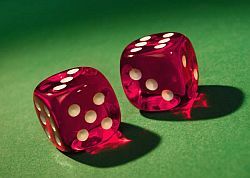 This introduction begins with rules and numbers then continues with craps games glossary A – C for part 1. Perhaps the most exciting game in the casino is craps. It is likely the loudest too. It is played with enthusiasm by bettors who play craps online and off. Additionally, craps lingo and jargon is arguably the most extensive and unique for any casino game, as you will see in this glossary. A run through the numbers=2, 3, 12 are craps-losers. 7 and 11 are ‘natural’ winners. Craps Point Numbers are 4, 5, 6, 8, 9 & 10 and these points must be repeated before a 7 is rolled. 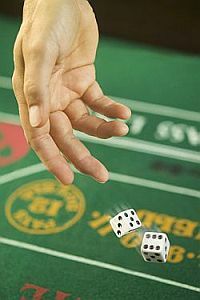 When a craps player is handed the dice to shoot, the first roll is called a ‘come-out’ and a 7 or 11 immediately wins. Whereas the 2, 3, or 12 immediately loses. If the shooter throws any of the other numbers: 4, 5, 6, 8, 9 or 10, the craps shooter continues to throw until either that same point number is rolled again, in which case it is a winner or until a 7 is rolled, in which case the shooter loses. Any other number has no significance to the pass-line wager. This explains why the 7 may win or may lose. If it is thrown on the first roll, it wins. If it is thrown when the player tries to repeat his first-roll number, it loses and is called a 7-out. Ace-deuce: wagering that the next roll will total 3. Aces: craps lingo for betting that the next roll will total 2. After Five, the Field's Alive: wagering that the next roll will total 5. All the Spots We Got: craps jargon for betting that the next roll will total 12. Any 7: bet that the next roll will be 7. If a 7 comes up, the player wins 4 to 1. Any Craps: wager that next roll will be 2, 3, or 12. Player wins 8 to 1. Arm: a skillful player who can change the odds in his/her favor. Back Line: craps lingo for don’t pass line. Back Line Skinner: betting that the next roll will be a 7. Bank Craps: original term for the game where players bet only against the house. Barefoot Bet: craps jargon for a come, pass line or don’t pass bet without any odds. Betting Right: betting on pass line and come bet wins. Betting Wrong: betting on don’t pass and don’t come, that the dice will not pass. Big 6: bet that a 6 will be rolled before a 7 comes up. Payoff is even money. Big 8: bet that an 8 will be rolled before a 7 comes up. Payoff is even money. Bones: craps game glossary lingo for dice or die. Boxcars: number 12 or wagering that the next roll will be 12. Boxman: the one person at the craps table who is seated. He/she takes care of things, for both the table and the players, keeps an eye on the payoffs, the bets, and more importantly, the average bets of all the players who want to be rated. Boxman also handles player disputes and is charge of the table’s chip bank, which is directly in front of him. The most experienced casino employee at the table, the boxman can overrule an unpopular decision. Buffalo: placing a wager on each of hardways and any seven. Buy Bets: betting on 4, 10, 5, 9, 6 and 8 where the player gives up a 5% commission or vig for a payoff at the correct odds. Winning means that your number is rolled before a 7 after the come out roll. Buy the 4 and 10: betting on 4 and 10 where the player gives up a 5% commission or vig for a payoff at 2 to 1 on place bets. Winning means that your number is rolled before a 7 after the come out roll. Capped Dice: craps jargon for crooked dice. Center Field: betting that the next roll will total 9. Change Color: converting chips to smaller or bigger denominations. Choppy: uneven table action where craps shooters are sevening out early and not many numbers are thrown. Cold Dice: this craps table has gone cold and the dice ain’t passing. Also cold table. Come: bet the pass line after the craps shooter has established a point. The next number rolled becomes your point. Come Box: area where come bets are placed. Come Out Roll: first roll of the dice in a betting round is the come out roll. Craps: dice rolled showing the numbers 2, 3 and 12. Craps Out: dice rolled showing the numbers 2, 3 or 12 on the come out roll. Crew: casino employees managing the craps table. What is a Proposition Bet in Craps? A. Bet made in the center of the table? B. Bet for the 6 and 8. C. Buying the 5 and 9. A. Bets made in the center of the craps table. Craps Game Glossary is presented in 3 parts.This introduction is the beginning of the distinctive language, lingo and jargon that defines the exciting game of craps.